Alonso adds that the change will be “grounded in the history of the character” – so just like how female Thor turned out to be the most obvious contender of all for the role, I’m gonna just go ahead and call this as Rick Jones, sans any evidence beyond his being the easiest choice. 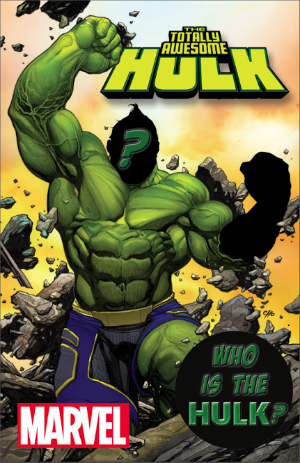 Who do you think Totally Awesome Hulk will be? And do you think Marvel just saw that another company had green superheroes who say “awesome,” and wanted in on that deal? Hulk want pizza too? Why is the left hand blacked out? Who’s gonna do my laundry today? Next Article June GEEKFUEL Unboxing, Featuring A CUTE KITTEN!